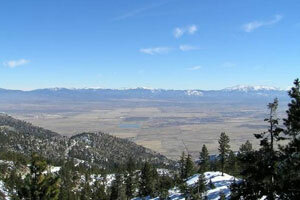 Find your own ski in and out by owner rental in Heavenly Valley-click on this link! Ski in, Ski out condo. Sits at the base of Heavenly Valley Ski Resort - 1 bedroom - 1 Baths, sleeps 4, min stay 2-3 nts- from $115/nt - Book it instantly! 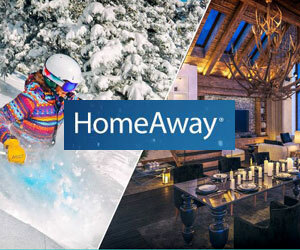 Homeaway 4449670 - Relish Lake Tahoe's natural beauty in comfort and style at this cozy 1-bedroom, 1-bathroom vacation rental cabin that comfortably sleeps 4. 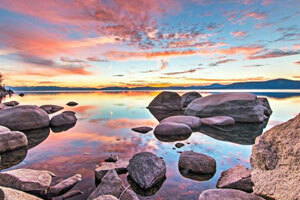 Set in a serene environment, you're minutes away from South Lake Tahoe's finest attractions. Whether you're seeking thrilling rides down Heavenly Mountain or relaxing days on the beach, you're sure to find the ultimate adventure here! Ski in, Ski out condo. 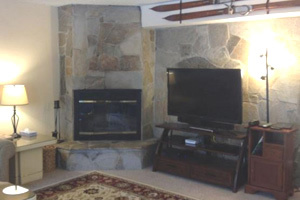 Sits at the base of Heavenly Valley Ski Resort - 2 bedroom - 2 Baths, sleeps 6 - from $275/nt - Book it! VRBO 685445 - Relax and enjoy your stay in the completely remodeled loft. Sleeps 4 - 6 people comfortable.1 Queen Bed, 1 Full Bed, 1 Queen Sleeper Sofa Air Mattress and 1 Twin Air mattress. 2 Fulls size baths. Enjoy amazing view sitting in the modern leather wing back chair on the top floor of the 2 story loft, or try out your cooking skills in the beautiful white kitchen with quartz counter tops and all new appliance. Take a nap on the temperpedic beds with beautiful linens that feel like a big hug as you tuck yourself into bed. Step out on one of the 2 decks to BBQ or after a long day on the slopes walk to the jacuzzi to relax. Ski in, Ski out condo. 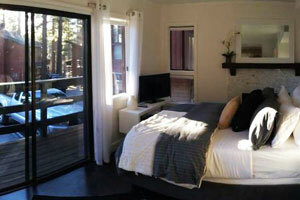 Sits at the base of Heavenly Valley Ski Resort - 2 bedroom - 2 Baths, sleeps 8 - from $275/nt - Book it! VRBO 78851 - Relax and enjoy your stay in the completely remodeled loft. Sleeps 4 - 6 people comfortable.1 Queen Bed, 1 Full Bed, 1 Queen Sleeper Sofa Air Mattress and 1 Twin Air mattress. 2 Fulls size baths. Enjoy amazing view sitting in the modern leather wing back chair on the top floor of the 2 story loft, or try out your cooking skills in the beautiful white kitchen with quartz counter tops and all new appliance. Take a nap on the temperpedic beds with beautiful linens that feel like a big hug as you tuck yourself into bed. Heavenly Condo - 3 bedroom - 2 Baths, sleeps 8 - from $262/nt - Book it! Family Friendly w Hot Tub - 3 bedroom - 2 bath - sleeps 8 - from $483/nt- Book it! -This beautiful 3-bedroom, 2-bathroom wooden home is characteristic of its surroundings, with natural wood siding and tree trunk pillars. Hardwood floors and interior wood paneling add to the alpine motif. Stunning furniture and modern touches blend seamlessly to create the perfect getaway for your family, capable of sleeping up to 8 guests comfortably. A gas fireplace and large flat screen TV in the living room make it the perfect place to relax after a long day of skiing. 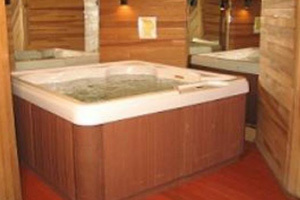 A private, 4-person hot tub is also ideal for unwinding and soothing sore muscles. In the summer, cook out on the charcoal grill in the home's large, enclosed yard. 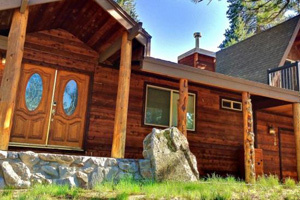 Minutes From Heavenly - 4 bedroom - 3 bath - sleeps 12 - from $275/nt- Book it! Trip Advisor #FKN2380401 - This property is a 4bd/3ba. It is in a fantastic location that is ½ mile to the Heavenly Stagecoach lifts!! No steps or stairs needed to climb, just walk right in from the parking lot. There is a private INDOOR hot tub on the lowest level which is a fantastic way to relax with friends after a long day hiking or on the slopes! We are about 4.5 miles to lake level where you'll find all the shops, restaurants and casinos….if you don't want to drive, be sure to check out the BlueGo shuttle which has a stop right in our parking lot! We have made a lot of updates to this home and are constantly taking our renter's suggestions for additional improvements. This property has a wood burning fireplace, free Wi-Fi and a grill. 4 bedrooms - 3 bathrooms. Two of the bedrooms have queen size beds, 1 of the bedroom has a queen bed & twin over twin bunk beds, and a loft bedroom w/ 1 king & 1 queen bed. Three total bathrooms (one is a brand-new addition!). Private Indoor Hot Tub plus access to outdoor Hot Tub and Pool to be used by HOA owners only.